Direct messaging, eblasts, targeted social media posts, event credentials and more are all part of the hundreds of pieces of collateral the MMD team has created to help give the event a consistent look and feel. project : love rocks nyc! MMD helped reimagine a charity’s fundraising gala as New York’s premiere concert event. 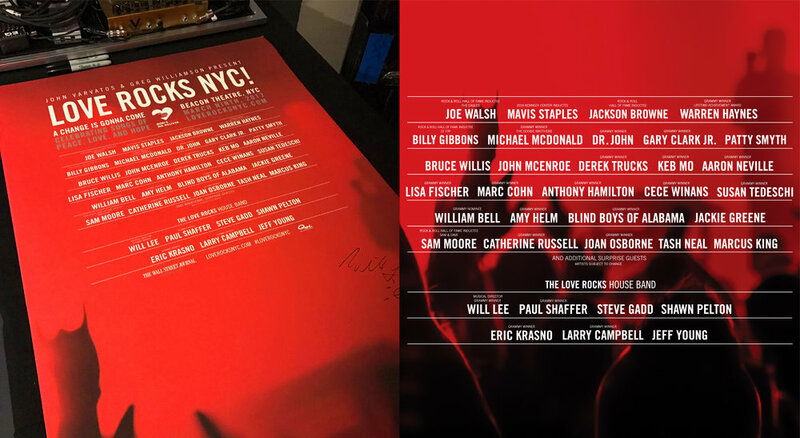 Hosted by Bill Murray and Bruce Willis, and including more than 40 Grammy winning musicians, Love Rocks NYC helped generate nearly two million dollars for God's Love We Deliver, with more then 288M media hits. The three-hour concert was an elevated rock & roll experience held at the historic Beacon Theatre in NYC, bringing together some of the most iconic musical artists on one stage for the first time. Working closely with the organization and sponsors John Varvatos and Greg Williamson, MMD created a distinctive graphic, color palette and feel for the event. Visit LoveRocksNYC.com to learn more. Continuing the overview - event step and repeat graphics will reinforce the event graphic when photos are released of attendees; also shown is an example of one of the high-circulation advertisements which ran in the Wall Street Journal. Set, lighting, and video design. Videos included changing content throughout the duration of the 3 hour show, sponsor sections, interviews and more.